Melanie Johnson works in the library at the University of Auckland as Copyright Officer. Melanie is also a member of the Universities New Zealand Copyright Expert Working Group which, advocates for reform of copyright and negotiates blanket licences for the copying of course content for distribution to students. Melanie also advises the other universities on copyright matters. Melanie trained as a lawyer and has worked for the university for the past 16 years. We first met Melanie in 2015 when she visited the UK and attended the UUK / Guild HE Copyright Working Group Summer Event. Her report on a recent event organised by the Australian Digital Alliance, seemed particularly timely given it is Fair Use / Fair Dealing Week this week from 26th-2nd March. Melanie tells us…. Calls to reform copyright are not new and are becoming frustratingly common and strident as institutions struggle to fulfil their mandates and stay within the law and RROs (Reproduction Rights Organisations) and publishers use polished campaigns to win the public’s heart and block attempts to carve out rights for users. 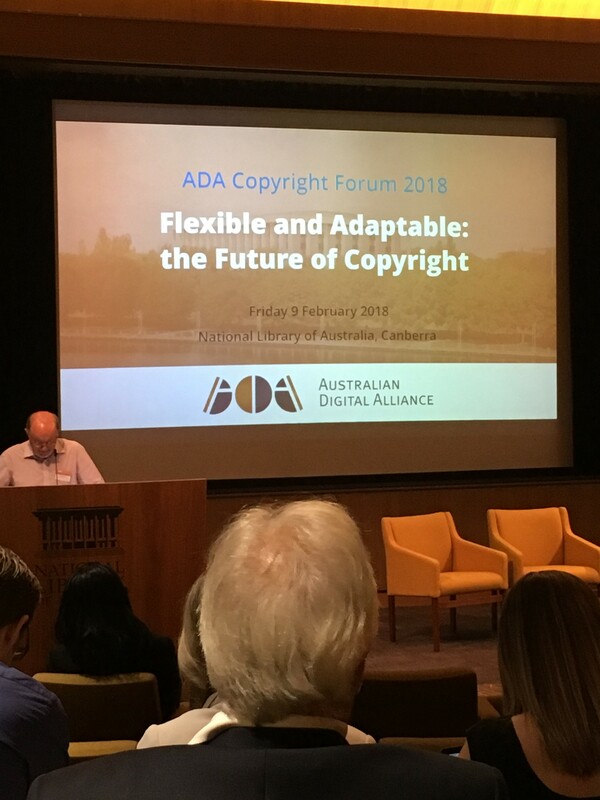 The theme of the Australian Digital Alliance Forum 2018: “Flexible and Adaptable: the Future of Copyright”, reflected an optimism and enthusiasm for change expressed by the speakers. The Forum presented a range of viewpoints, from academics, stakeholders and practitioners, and from a range of institutions and industries. Some advocated radical change and complete reversals; others more moderate revision. All agreed that copyright must change. Professor Ruth Okediji from Harvard Law School gave a presentation entitled ‘Copyright Law in an Age of Limitations and Exceptions’. She proposed that copyright change is in an economic and political crisis. Copyright is in the middle of a creative firestorm. Core values are being challenged by technology and cultural changes that virtually collapse binaries such as users and creators. Okediji observed that there have been no radical changes in copyright legislation with the primary caretakers of change being the courts and technology companies. Okedji’s challenge to copyright is to the assumption that creators alone are entitled to control the use of their works. Copyright reform must consider different kinds of authorship needed for the production of mass culture. Copyright is needed, not to incentivise authors, but to support publishers. The idea that everything coming out of the creative process is entitled to protection is flawed and contrary to how society operates. Our everyday communications should not be protected. Authorship is vastly different to how copyright envisages authors, an ideological construct debunked by modern scholarship. Authors copy by inspiration or imitation, borrowing from lived experience, creating new works using universal ideas. These works spring out of our cultural environment: if copyright law forbade imitation and copying, it would lose its moral justification. The myth that copyright incentivises authors was debunked by the presentation from Dr Kylie Pappalardo and Jessica Stevens on the report of their research: Imagination Foregone: A Qualitative Study of the Reuse Practices of Australian Creators. The researchers sought to go beyond an economic analysis of copyright. The study consisted of in depth interviews with 29 creators about the choices they make and how those choices are driven by copyright. This was not about file sharing, but the use of parts of existing works to create something new. The study found that creators are generally confused about copyright. They often confused fair dealing with fair use and were unclear about what they could reuse. Some creators got permission for uses that fell within the exceptions and others used works without permission that were not covered. Generally they were tolerant of others making use of their works with proper attribution, but if a lot of money was being made they wanted to share in the profits. Creative and transformative reuse was accepted but not blatant “ripping off”. 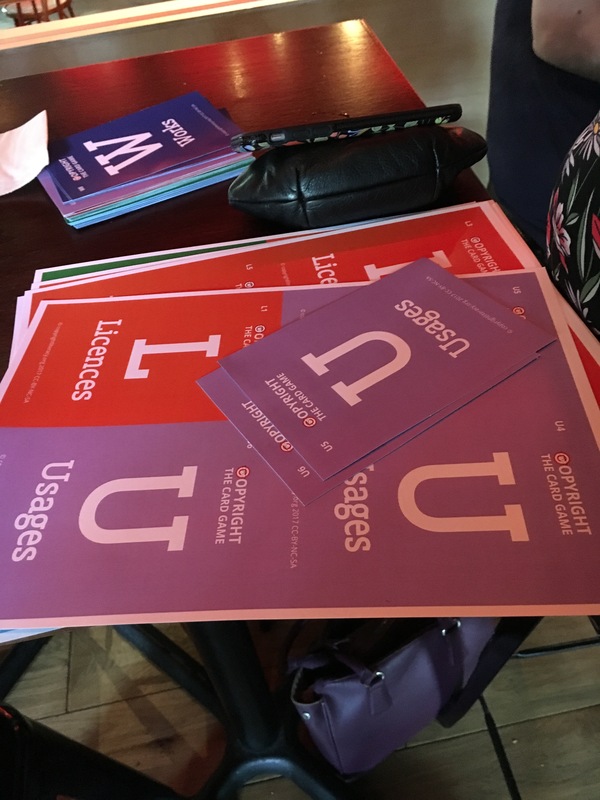 Many participants at the ADA Forum had found seeking licences to reuse work a frustrating and confusing process. Often responses from rights owners were slow. Large publishers tended to ignore small requests as not worth the transaction costs to them. Kylie gave the example of an established composer who, as a student, had set music to a poem. The work was chosen for a play on the London stage. One year after the play was staged and he had rewritten the lyrics he finally got permission from the publisher to use the work. Emerging artists flout the law and fly under the radar. Veteran artists took calculated risks. They may exhibit a work in a gallery, but not put it online. Some would change a work they were copying and paraphrase rather than quoting from the original. Others would degrade the sound to get away with using a particular scene. Others abandoned or avoided using other people’s work and moved away from particular practices, for example appropriation and sampling, because they were too risky. Creators were conscious of their identity as Australians and the potential impact of not being able to reuse content would have on Australian stories. There are grey zones of tolerated use that are technically infringing that creators operate in. Many did not see a disconnect between using other people’s work and other people using their work. Most wanted to support emerging artists. All had tense relationships with the copyright system and were grappling with the permissions process on a daily basis. Both Seb Chan from the Australian Centre for the Moving Image and the Deloitte report discussed below, cited Soda Jerk, a New York based 2-person art collective, who reuse content, as an example of Australian artists “whose work is unlikely to fall within the current fair dealing system exceptions”, choosing to live and work in the U.S.
Okediji believes that libraries and educational institutions should be the primary beneficiaries of copyright, not authors. Our cultural institutions are the greatest providers of the public good. All WIPO countries have exceptions for libraries, illustrating the failure of copyright to recognise its fundamental premise. It is wrong to subject reuse to the copyright owners’ sovereignty. The public good should be the primary consideration. Human rights should be the focus for copyright reform. Speakers amply demonstrated the failure of the current system to meet the needs of education in Australia. Roxanne Missingham (University Librarian, Australian National University) noted that universities are paying millions of dollars to access content written by their staff. Delia Brown (national copyright director of the National Copyright Unit) noted that schools are paying millions for licences to use content for teaching purposes that is freely available on the web and that institutions in other jurisdictions do not pay for. If contracts are allowed to govern access to knowledge to the extent user’s rights are lost, then copyright becomes irrelevant. Those responsible for managing museum collections and archives found copyright frustrating as they work to maintain and share their collections with the public. There is pressure to provide online access as reading rooms close, and to preserve audio-visual tapes that are deteriorating and could be lost forever if not digitised. Contemporary culture, particularly interactive games, designed to be played rather than viewed and hosted on platforms controlled by rights owners, are some of the most challenging and difficult to collect, preserve and to unravel the rights to in order to make the works available. Most Australian institutions require clearance for all rights before showing works. Chan noted that institutions such as the Smithsonian operating under fair use do not have to contend with the same difficulties. The sector needs to be not so risk averse and more creative in interpreting the current exceptions. Okediji’s solution for the problems faced by cultural institutions is to exit from the 1886 Berne convention. Harmonisation has outlived its usefulness and reform processes must be liberated to best reflect cultural progress. Diversity of forms of creative output are greater than those available at the time of the Convention. Technology enables users to bypass state mandates or permission of owners. Technology has outpaced business models. Some copyrights are less useful in new markets. Copyright plays a greater role in human welfare and affects a wider range of rights than contemplated in the Convention. Technology cannot be ignored in this debate. Brown noted how education is changing rapidly with personal devices, artificial intelligence, collaborative learning spaces, and open education platforms becoming the norm. Okediji challenged us to consider how artificial intelligence shapes the contours of what can be accessed and whether it is capable of considering fair use. She questioned whether we should tolerate the automatic divestment of authors’ rights by technology. There is no benefit for society when technology dictates what can be accessed. Suggestions for a radical rethink of copyright are not new. Professor Jill McKeough’s (Commissioner in charge of the Inquiry into Copyright and the Digital Economy) presentation Text, Lies and Stereotypes: Australia’s Copyright Reform Process focussed on impediments to change. Since 1998 there have been a series of reviews and recommendations for changes to the Australian Act, but after 20 years of compelling evidence of the benefits of introducing a fair use type exception there has been no change. As Commissioner, she knows the tactics used by rights owners to block changes. The pushback the Commission received from rights owners was intense, with campaigns to generate hysteria around piracy and fair income for artists, visits by top U.S. executives in the motion picture industry to members of parliament. In one instance, the Commission received 400 letters from authors, teachers and publishers claiming fair use would deprive them of their rightful income, when “clearly they had not read the discussion paper”. Deloittes’ Partner John O’Mahony officially released yet another report, Copyright in the digital age: an economic assessment of fair use in Australia detailing the impact of not having a flexible and principle-based copyright system. It was not a wish list for copyright reform but concluded that fair use is one of few levers that can drive change. The study found no evidence of harm to traditional rights-holding industries. While there are ongoing problems with piracy, fair use would not contribute to this. Any short-term costs to introducing fair use could be reduced with Government guidance. Sam Ahlin, Director of the Copyright Law Section, Department of Communications and the Arts gave an overview of the reform agenda. The piecemeal approach taken to reform over the coming two years to such issues, as orphan works, flexible exceptions and exceptions for libraries and archives, does nothing to instil confidence that there will be a radical rethink of copyright in the near future. The implementation of the Marrakesh Treaty in Australia shows how change can be effected for uncontroversial issues. Sarah Runcie, (the Australian Publishers Association) formed the Australian inclusive publishing initiative. This brought interested groups together who had never sat in a room together before. As a result of their collaboration, the digital workflow of publishers will have accessibility embedded into it. The group is continuing to work together to achieve accessibility. Collaboration is also developing in the gaming industry with publishers starting to see benefits in allowing the user community to “mod” their games and add new content. While there was universal agreement that there must be a radical rethink of copyright, or future creativity in Australia is under threat, there seemed little optimism that this would happen in the short term. Creators and institutions will continue to either operate in risky, grey areas in order to make, curate, preserve, teach and share with the public or they will avoid projects that reuse existing content. The Australian government is making moves to address some of these issues over the next two years, but is not going to radically rethink copyright. This will take a strong legislature that is prepared to stand up to powerful lobby groups from the U.S. who believe they will lose licensing revenue from Australia and New Zealand if fair use is implemented in these jurisdictions. We’re grateful to Melanie for her report on this event. Further details of the event including videos and presentations are available from the ADA Copyright Forum website. We are also delighted to report that Melanie will be joining us in April at Icepops where she is presenting as part of the World Cafe. Interesting and important thoughts, looking forward to meeting Melanie at Icepops!